Jeff Pack wrote: Running the suit 10 clicks open, you don't want to feel any squeeze at depth. Or like I told you, run it closed, and open on ascent, but that's more tricky. Those valves still reverse flow if you run them squeezed. Next dive ill put a bit more air in the suit, and close the deflator a click or two and see what that does. A flute without holes is not a flute, a doughnut without a hole is a danish. You will not hear any hissing and the leaks may make only the tiniest bubbles, slowly and very hard to see. It doesn't take much of a hole to give you a wet arm or chest. I'm speaking from personal experience here. Eh, it could be the inflator valve is defective, or it could be a bit of grit could have gotten in when you attached your hose, or the valve may need to be tightened. Sometimes it's subtle, sometimes you can feel a squirt of water when you add some air when the valve is bad or the hose connection is bad. If there are no obvious leaks when you test the suit, just tighten what you can, look for sand in your hose the valve, and see if you notice anything when you add air the next time. Honestly weird random leaks are a part of dry suit diving, but you should have mostly dry dives with a new suit. Running the suit 10 clicks open, you don't want to feel any squeeze at depth. Or like I told you, run it closed, and open on ascent, but that's more tricky. For testing just run the suit with no squeeze. Don't change your weighting yet either. Desert Diver wrote: Put plastic drinking cups in the wrist seals and a gallon pitcher in the neck seal, blow it up and spray it with soapy water. Sometimes the inflator valve or exhaust valve are not attached tightly enough. I've found a little silicone grease, not cement, on the surfaces lets them tighten down nicely and keeps them from leaking. I did exactly that, at the dive shop, and we sprayed soapy water all over the suit. Neither of us heard hissing, or saw any bubbles. Suit looked like the stay puff man haha. And thanks for the silicone grease tip, good idea to remember! Put plastic drinking cups in the wrist seals and a gallon pitcher in the neck seal, blow it up and spray it with soapy water. Sometimes the inflator valve or exhaust valve are not attached tightly enough. I've found a little silicone grease, not cement, on the surfaces lets them tighten down nicely and keeps them from leaking. Penopolypants wrote: It's also possible that your inflator valve was letting water in as you added air. Glad to hear the dive went well! Perhaps running the suit too squeezey, as those valves will let water in. Also, cutting those neck and wrist seals may not have been a good plan in retrospect. bad inflators, bad zippers, and loose/folded neck seals are all possible. It's also possible that your inflator valve was letting water in as you added air. Frankly I'm not terribly impressed with 'professional' suit checks. I think I do better myself with a used tank of air and a soapy spray bottle after sealing up all the outlets. The dive went well! But I came up wet in the chest and legs. Had the suit checked, and no leaks there, so maybe a folded neck seal or something. It was wayyyy easier than I expected it would be. I was using my suit for squeeze and my BC for buoyancy, was able to stay in trim the whole time! I did hit bottom a few times though... All in all it was awesome, hopefully next dive Ill be dry!! 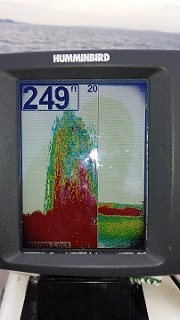 PS had 32 lbs and had no problems at the end of the dive. If you do this on a day that Gabby's there you can always toss up a few lbs after you get in the water and get a general feel for your sinkability (did I just invent that word?). Exciting stuff I remember breaking into the drysuit realm. I agree with Mr. Nic. As long as you are not super overweighted you should be fine. As Jack said just watch your NDL just in case you are light at the end of the dive. CaptnJack wrote: Id' start with 28lb, but you might be too light at the end so don't push the NDLs cause you might float up on your safety stop. Thanks. I might do 30 or a little more to be on the safe side. Your profile indicates you are a newer diver. In my experience, the less experienced I was, the more weight it required to sink me. Many reasons for this - more movement in the water, skulling, etc, keeping more air in my lungs as opposed to letting it out more deeply, etc etc. Since you only have the one tank, I'd start a bit overweighted, do your dive, then mess with a weight check at the end of your dive with your buddy's help. hmm, a mk2 and not a mk3? thats odd. In either case, thats a lofting undergarment (Primaloft) so it'll take some lead to sink it. Its the Whites Glacier Series MK2. Maybe "onesie" is a better term for it? Id' start with 28lb, but you might be too light at the end so don't push the NDLs cause you might float up on your safety stop.